Nationalist parties in Spain’s Basque Country have won regional elections, an outcome expected to fuel calls for independence. 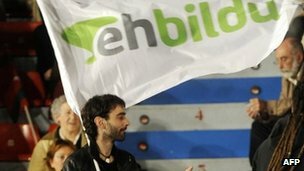 The conservative Basque Nationalist Party came top in the poll, closely followed by the Euskal Herria Bildu coalition of left-wing separatists. In Galicia’s regional poll, the centre-right People’s Party of PM Mariano Rajoy held on to its absolute majority. The elections are seen as a key test of the government’s austerity policy. The Basque Nationalist Party (PNV) won 27 seats in the regional parliament, while Bildu took 21. The opposition Socialist Party trailed in third place with 16 seats, followed by the Popular Party (PP) with 10.